The Batik Loach (Mesonoemacheilus triangularis aka Nemacheilus triangularis) more commonly known to tropical fish keeping enthusiasts as the Zodiac Loach, is found in the Manimala river and the drainages of other river systems on both sides of the Western Ghats mountain range, in the states of Kerala and Tamil Nadu, India. It is commonly found in almost all west flowing rivers and in some east flowing rivers in southern India. Batik Loaches (Mesonoemacheilus triangularis) are found in clear, fast moving, highly oxygenated, heavily forested headwaters, streams, and smaller rivers of it’s range. They prefer substrates of coarse sand, gravel, rocks, and large boulders that are layered with algae, diatoms, detritus, worms, small insects, and other microorganisms that they feed upon. The flow rate of the streams that they live in can vary dramatically depending on the amount of rainfall the monsoon season generates. Although Lagenandra and Blyxa spp. have been recorded in some of the lower altitude streams they have been collected in, aquatic plants are usually not present in their environment. 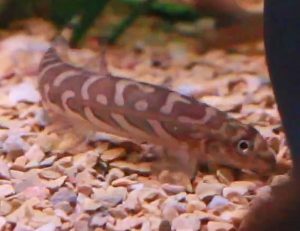 The Zodiac or Batik Loach has an elongated tan to light brown body covered with darker brown, oblong saddle or reticulated snake like markings edged in black on the dorsal areas, and a similar pattern above the plain ventral area, that extend the entire length of the fish. Zodiac Loaches grow to a little over 3 inches in length, but are usually smaller in an aquarium environment. Adult females grow slightly larger than males and have rounder bellies, especially when gravid. When sexually mature, males develop thicker pectoral fins with rows of tubercles. They also possess a small sub-oribtal flap. Mesonoemacheilus triangularis are best housed in a flowing stream or river biotope setup of at least 20 gallon capacity, with a substrate of sand, fine gravel, river rocks, some smooth boulders, and a few branches of driftwood arranged to form small crannies, caves, and shaded areas. Plants are not necessary but Microsorum, Bolbitis, or Anubias spp. can be attached to the driftwood or rocks for aesthetic value. Because they need highly oxygenated water to thrive, at least a couple of power heads with an air stone should be included with the filtration system to replicate the conditions they are found in. A canister filtration system is highly recommended for this species. Like all species that inhabit mountain streams, Batik Loaches are intolerant of accumulated wastes and require regular 30 to 50% water changes on a weekly basis to maintain the pristine water conditions they require. Although a single species biotope system is recommended for Batik Loaches, they can be housed with other species found in the Panniyar river basin such as Hauludaria fasciata, Rasbora daniconius, Garra mcclellandi, Homaloptera santhamparaiensis, Tor khudree, Barilius bakeri, Devario aequipinnatus, etc. When housed as a single species, they should be maintained in groups of at least 4 to 6 individuals to minimize potential aggressiveness. To date, there has been only one instance of Mesonoemacheilus triangularis reproducing in an aquarium environment. A pair that was removed from a community tank was moved into a 10 gallon aquarium with a hang on filter. The filter discharge was directed towards a plastic box filled with gravel, and spawning mops were placed into the tank. The water temperature in the tank was recorded at 76°F . The male developed reddish brown breeding colors on the lower body, but was found dead in the tank the following morning. When another male was introduced into the tank the next day, mating occurred and hundreds of small clear, non-adhesive eggs were discovered in the spawning mop and on the base of the tank. When the parents were found eating the eggs, they were removed from the tank and the eggs hatched out approximately 24 hours later. After hatching, the spawning mops, tub of gravel, and back filter were removed and replaced with a sponge filter. After the yolk sacs were absorbed by the fry, they were fed a starter product until newly hatched baby brine shrimp could be consumed approximately 24 hours later. The recorded breeding yielded approximately 500 saleable individuals. In their natural habitat, Batik Loaches feed on small crustaceans, worms, small insects, zooplankton and small amounts of plant matter. In an aquarium environment, they can be fed a quality flake food but they require regular feedings of live or frozen Daphnia , brine shrimp, bloodworms, etc. to keep them healthy and conditioned. The Zodiac or Batik Loach (Mesonoemacheilus triangularis) is occasionally available to tropical fish keeping enthusiasts from specialty shops and online importers at quite reasonable prices. Although on the IUCN Red list of threatened species as “least concern”, it’s habitat is threatened by widespread deterioration and transformation due to agricultural expansion.